AKG K450 review | What Hi-Fi? Headphones Product of the Year, Awards 2011. Versatile portable on-ears that sound amazing for the money. Portable on-ear headphones are increasingly popular, and understandably so: unlike earbuds, they don't involve shoving anything right into your ears. And while a pair of 'proper' headband-toting headphones is never going to be as compact in your pocket as a pair of buds, some models aren't as far off as you think. Take these AKG K450s, for example: thanks to folding arms, small, twisting cups, and a compact case, these in-ears are very portable indeed. But that's not why these headphones get five stars - and our Product of the Year Awards; these AKGs are winners because of sound quality more than anything else. The AKGs sound crisp and punchy, with lots of attack when needed on tracks such as the Foo Fighters' Monkey Wrench. This isn't a clinical or hard sound, though (especially once the headphones have benefited from a day's worth of solid use). There's still fluidity here, and the K450s are never baited into harshness. Switch to the soundtrack for The Dark Knight and the AKGs prove that they're able to produce decently deep bass with plenty of weight. They're also impressively dynamic and insightful, so you get all the drama and epic crescendos of the score, along with loads of fine detail. And if you're a smartphone user? For an extra £30, you can pick up the matching HA450 Communications Kit, which adds a mic and controls that work with most models, including Apple iPhones, Blackberrys and many Nokias. 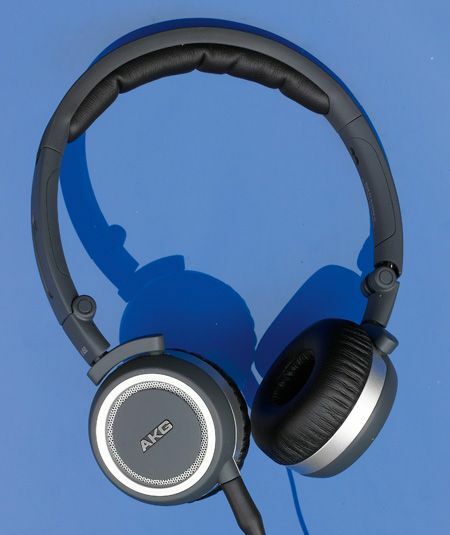 Originally the AKG K450 headphones cost £150, and even at that price they were a five-star buy and vying for class-leading status. The major price drop to just £100 (or less) makes these a clear winner.